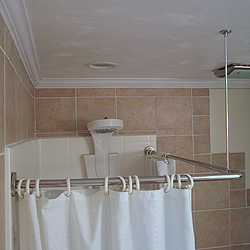 This curtain rod kit for a corner shower is 1" in diameter with a polished stainless steel finish. Mounting flanges are welded and concealed with snap-on covers. A "J-hook" is provided with ceiling flange to adjust height at front corner.